Get in the holiday spirit! 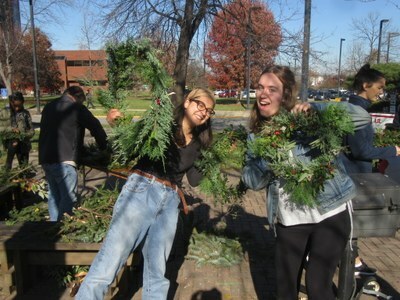 Come learn how to make your own beautiful wreath using a variety of plant materials from campus and herbs from our garden. It's easier than you might think and you'll take home something beautiful and unique. This is the last in our fall series of Garden Workshops on Fridays at noon. The Garden Commons is open to participation any time from students, staff, faculty, and community members. Everyone who comes is welcome to share in the harvest! Connect with us and get all the details on our Facebook Page.